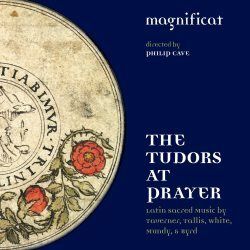 I’ve not heard any of the previous discs that Philip Cave and Magnificat have made but I’ve read good things about them. I was delighted, then, to get the opportunity to appraise this, their latest recording. The pieces that comprise this programme were probably written between the 1530s and the 1570s. It’s worth reminding ourselves what a turbulent time this was in England as politics and religion became entwined in an often-toxic mixture. During the reign of Henry VIII (1509-47) the Protestant Reformation began, though by no means all vestiges of the Roman liturgy were swept away. Under Edward VI (1547-1553) a much stricter form of Protestantism was introduced, only for Catholicism to be restored with a vengeance under Edward’s sister, Mary (1553-58). Then during the long reign of Elizabeth I (1558-1603) English Protestantism became more firmly established. These were difficult times in England: being caught on the wrong side of the politico-religious divide could cost you your head. Composers were by no means immune from the state of flux and were obliged to tailor their religious music to fit the prevailing climate under various monarchs. Yet the Latin observances continued, sometimes with the approval of the authorities, sometimes with the authorities turning a blind eye, and sometimes in covert circumstances. It’s hard to imagine William Mundy’s magnificent, large-scale Marian anthem Vox Patris cælestisbeing sung under covert circumstances; it’s expansive music on a grand scale. As Kerry McCarthy’s splendid notes tell us, this was almost certainly a product of the brief Marian revival during the reign of Queen Mary. The text is an elaborate paraphrase of words from the Song of Songs which Mundy set in up to six parts, though often he simplifies the texture, reducing the parts down to three or four separate lines. I very much like Philip Cave’s spacious treatment - his performance takes more than two minutes longer to unfold than the one by Peter Philips and the Tallis Scholars (review) and Harry Christophers takes four minutes less than Cave (review). Despite Cave’s more expansive approach I didn’t feel any lack of tautness in the performance but he gives the music even more space in which to breathe than do his two distinguished colleagues in their very fine performances. In this Magnificat performance I admire very much the clarity with which the lines and the words are enunciated. In this they’re helped by the excellence of the recording and the intelligent placing of the microphones and layout of the choir means that you can also hear in a very satisfying way the effects when Mundy switches from one combination of voices to another. The consummation of a magnificent piece of musical architecture, here marvellously performed, is a gloriously prolonged and elaborate ‘Amen’. It’s interesting to move from Mundy’s grand piece to Robert White’s Marian piece Tota pulchra esin which White sets the more conventional words from the Song of Songs rather than the elaboration used by Mundy. Both White’s chosen text and his music are more concise. However, even if this six-part piece is on a less ambitious scale it’s still highly impressive. The vocal lines interweave more in White’s piece as compared to Mundy’s and so, paradoxically, in this less grand piece the words are less clear. Instead White achieves the effect of a constant ‘buzz’ or stream of devotion. William Mundy is represented also by two smaller pieces, his psalm-motets, Adhæsit pavimentoand Adolescentulus sum ego. Both of these are much less ambitious in scale and design than Vox Patris cælestis. In Kerry McCarthy’s words these highly effective pieces “rely instead on through-composed imitative polyphony that is deftly woven into a dense six-part fabric.” The same could be said of White’s psalm-motet, Domine, quis habitabit? Philip Cave’s programme also includes a single work each by Taverner, Tallis and Byrd. The former is represented by his Quemadmoduma 6. Stylistically this is much less elaborate than much of his music, eschewing what Kerry McCarthy pithily refers to as “the wandering gothic tracery of much early Tudor polyphony”. The six-part writing is simple and direct in expression and in that sense might have well conformed to Cranmer’s requirement for simplicity of expression in church music. In the notes we read that the music survived as an instrumental piece in an Elizabethan household manuscript and was only re-joined to its text comparatively recently. Listening to it one can readily imagine a consort of viols playing it. The pieces by Tallis and Byrd were both published in the collection Cantiones sacrae (1575). Apparently, there have been suggestions that Tallis could have written Suscipe quæso Domine, with its heavily penitential words, as early as 1554 though Kerry McCarthy seems to favour a later date. It’s a wonderful piece and here it’s sung with just the right blend of poise and intensity. Tribue, Domine, an equally memorable piece, finds Byrd apparently experimenting with textural variety by alternating ‘full’ and ‘verse’ sections. The quality of performance here is uniformly high. In discussing Vox Patris cælestisI referred to the clarity of the singing. That’s true throughout the programme. Equally consistent is the excellence of balance and blend. These are singers who are evident experts in this filed – as a glance at the names on the roster of singers readily confirms – and they’re working under an equally expert director. Linn’s presentation is excellent. Philip Hobbs is highly experienced in recording such music and it shows. He presents the performances in clean and clear sound with just the right degree of ambience around the voices. It’s a lovely sound. Kerry McCarthy’s notes are excellent and the booklet as a whole is very nicely produced. I’m very glad that my first encounter with this fine ensemble has lived up to my expectations.